Canadians love small and medium sized businesses but SMBs want more affection from the government too by way of tax breaks on tax purchases and less red tape. 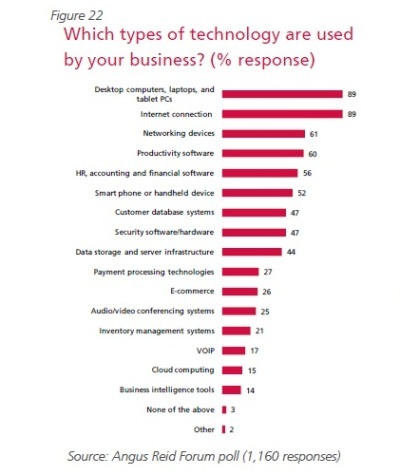 This was part of the findings of a recent survey on SMBs and their technology investments. The poll also indicated that while hesitation to purchase new technology remains, a large majority of Canadian SMB owners and decision makers feel that technology tools they bought either met or exceeded their expectations. 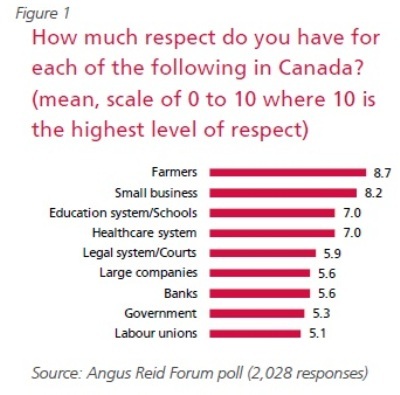 The survey, titled Perspectives on small business in Canada, was carried out by Angus Reid Forum and commissioned by the Canadian Federation of Independent Business (CFIB) in partnership with Hewlett-Packard (Canada) Co., and Intel of Canada Ltd. The first phase of the survey questioned more than 2,000 adult Canadians across the country and the second phase polled 1,160 owners and senior employees of SMBs from various industries. While 94 per cent of Canadians said they admire entrepreneurs what is even more telling, according to Doug Bruce, vice president of research for CFIB, is that 92 per cent of the respondents said they would approve of an immediate family member starting a business. “Clearly there is a lot of respect and admiration for SMBs in the country,” said Bruce. “The desire to be their own boss ranks as the top reason why Canadians want to set up their own business,” said Elaine Mah, business marketing manager for Intel Canada. She said the other top two reasons were the opportunity to make better use of one’s skills and knowledge and flexibility in work hours. The survey also turned up figures that backed long standing challenges faced by SMBs. “These are the areas in which small business needs government to reduce barriers so that business can continue to flourish, create jobs, support families and give back to the community,” according to CFIB’s report. But Bruce of CFIB said small business owners feel that the government should exert greater efforts to create a better environment to thrive. He said 89 per cent of Canadians polled feel the government “undervalue” the contribution of entrepreneurs and small business. “We recognize that by declaring 2011 The Year of the Entrepreneur, the Federal government is sending a message that it supports small business . But SMBs are saying the government can do more,” said Bruce. For instance, he said, the government can streamline regulatory paper work that small businesses are regularly subjected to. “The time and effort required to wade through the sea of red tape has been estimated to cost SMBs a total of $30 billion,” he said. For instance, he said, small businesses would benefit if capital cost allowances on technology and equipment they purchase would allow for “faster depreciation rates”. “If SMBs were eligible to write off their tech purchases much faster, that will be a bigger benefit Bruce said. In general, SMB operators believe the technology they purchased is providing good value to the business, said McAvoy of HP Canada. 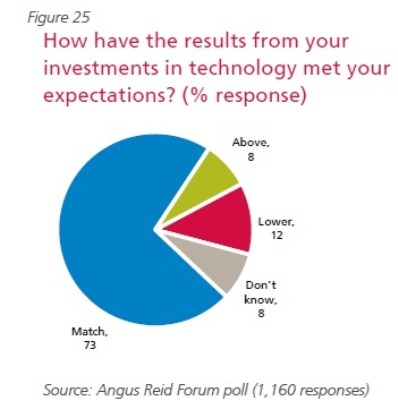 He said as much as 80 per cent of the respondents feel their investment in technology matched or exceeded their expectations. However, perennial challenges remain. For example when asked how quickly their business adopted the latest technologies compared to their competitors, 46 per cent of the respondents said the bought technology products at the same time as their competitors while about 30 per cent said they bought technology products only after their competitors did. “For many small companies it is a Catch 22 situation,’ said McAvoy. Businesses know that technology out there can improve their productivity and boost the bottom line, but they are not so sure which technology to purchase or if they have the knowledge to use it effectively, he said. The survey also revealed that desktop PC, laptops, Internet connection and networking equipment still topped the tech purchases of SMBs while cloud computing and business intelligence tools were way at the bottom of the list. “There are definitely a number of technologies that SMBs are not yet taking advantage of,” said McAvoy.